We have a number of facilities available through our automated text platform. It's a good idea to put 07950014111 in your contacts/phonebook on your phone, so that it is always to hand, if you need to use any of the following when you are out and about. Texts to 07950014111 are free from your 1pMobile, from anywhere in the world. When top-up by text is enabled in your account, and you have stored payment details, you can top-up your phone at any time by sending a text message of TOPUP to 07950014111. You can also top-up larger amounts by texting TOPUP followed by the amount you want to top-up to 07950014111. E.g. texting TOPUP 20 to 07950014111 will add £20 to your phone from your stored payment details. The minimum top-up is £10 and the maximum is £90. Each top-up by text will add the relevent number of days to the top-up requirement counter (£10 adds 120 days, upto £90 adds 3 years). To check your real-time balance dial 150 from your phone. A recorded announcement will read you your latest balance. 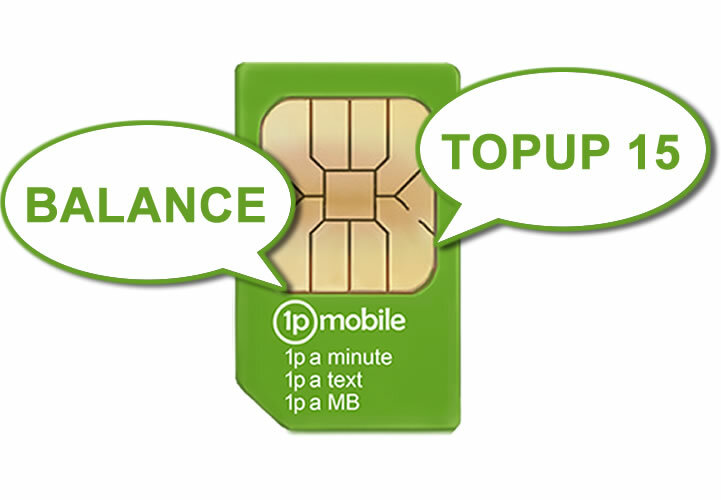 You can also text BALANCE to 07950014111 and we will text you back with the latest cleared balance we have. There is sometimes a delay between the balance via the text service and the figure given via 150 as call rates are checked and verified to ensure that all is correct before deducting funds from your account/phone balance.